The film is 12 Years A Slave. The film is directed by Steve McQueen, with a screenplay by John Ridley, adapted from Solomon Northup's memoir Twelve Years A Slave. Solomon Northup was born in 1808 in Saratoga Springs, New York. He was an African American born as a free man in a non-slave family. His father, Minthus Northrup, had been a slave freed in the will of his owner who married another freed woman. Solomon was one of the families two sons. In 1829 Solomon married Anne Hampton, a mixed race black woman. They had three kids, Elizabeth, Margaret and Alonzo. The owned a farm in Habron, New York. Solomon and his wife had many jobs and in 1934 they decided to sell the farm and move north to Saratoga Springs. Again Solomon held many jobs including building jobs and performing the violin at a number of venues. Due to the seasonal employment, Solomon was interested in other opportunities which lead him his young thirties to be enticed by a job offer that first lead him to perform as a fiddler in New York City. His family was unaware of the details of his travel, and offered a large sum of money he accepted a gig that would have him performing in Washington DC, a place where the slave trade was very large. Upon arrival in DC he was drugged, sold into slavery to James Burch, a slave trader who claimed he was a fugitive.He was taken to New Orleans, Louisiana to be sold. He convinced a sailor to send a letter to his family during this time. In New Orleans, Burch's partner Theophilus Freeman sold Solomon under the name of Platt to a Baptist minister named William Ford. Ford was also a planter on the Red River. Burch had a good relationship with Ford helping him with a number of projects such as moving logs more efficiently down the river. But when Ford found himself in financial crisis he had to sell 18 slaves, including Solomon. In 1942, Solomon was sold to the abusive John M. Tibeats, an abusive carpenter who fortunately under his overseer Chapin was saved from some lynching. With an outstanding bill to Ford for the purchase of Solomon, Chapin was able to remind Tibeats of the cost that would be associated with killing Solomon. Solomon and Tibeats had conflict and when Solomon ran away back to Ford he was eventually moved to other projects. He would eventually be sold again to Edwin Epps. While working for Epps, Solomon was fortunate to meet and befriend Samuel Bass in 1952. Bass, a Canadian carpenter, helped at great risk contacting Anne in New York who was working with a lawyer to save and free her husband. The New York Governor, Washington Hunt, who appointed family member and lawyer Henry Northrup as his legal representative. Henry Northrup worked with the state of Louisiana and January 4, 1953 Solomon was freed again. Solomon became active in the abolitionist campaigns upon his release. Information about when he died and the circumstances of his death are unknown. The film 12 Years a Slave chronicles the journey of Solomon Northup using his memoir as the source material. In addition to Solomon Northup being portrayed by Chiwetel Ejiofor, the film stars a really strong cast of supporting performers. Anne Northrup is portrayed by relatively-unknown Kelsey Scott, and their daughter Margaret Northrup is portrayed by the recent young Oscar nominee Quezenhane Wallis (Beasts of the Southern Wild). The primary slave traders James Burch and Theophilus Freedman are played by Christopher Berry and Paul Giamatti. The first slave owner William Ford is played by Bennedict Cumberbatch. The cruel slave owner John Tibeats is played by Paul Dano. His third slave owner Edwin Epps is played by Michael Fassbender. Canadian carpenter Samuel Bass is played by Brad Pitt. The film also features Alfe Woodard and Sarah Paulson. 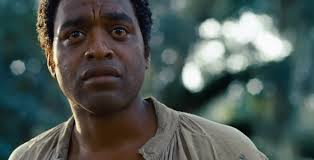 Chiwetel Ejiofor has been recognized with awards and nominations for other work previously, but never an Oscar nomination. Will his portrayal in this incredible and challenging historical film earn him an Oscar nomination or even a win for his role as this Real (Reel) Person?